The picture, with the fingers strap, makes these pads look like multiple fingers can fit in, and the puff would fit and fill the circumference of a powder tin or container. These puffs are child size and are about 1/3 the size I expected. If I fit 2 fingers in, the strap would tear. The price was incredible, but should know the item fit the price. Just the right size for compacts they make now. 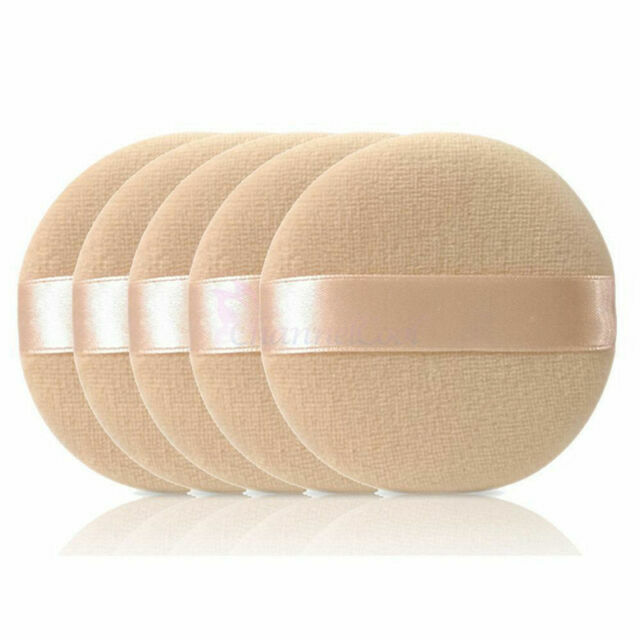 They give you a small thin piece of sponge that breaks the first time you use it and this is made just for this, love them for all my compacts thank you. TERRIFIC qual. Well shipped -- w/i 30days. * $!! The main point. *Light fluffy well wrapped powder puffs in small shipping bag -- arrived 30 days as promised from the East. Great to use while doing your face! Great puffs to wear while doing your makeup and never touch your face. Also great for blending out the jawline. I use one for about a month then move on to a new one. Great price. Exactly as pictured & described. Nice size for compact.